Hopefully you get time to check our last newsletter of 2011 before escaping for Christmas. A lot has been going on over the past couple of months. In this issue: Russian Boat foundered in Ross Sea, CCAMLR Update, short film competition winners announced, what's been in the media, Last Ocean documentary update and we meet team member and conservation photographer John Weller. I feel for the 32 crew of the Russian Fishing Vessel Sparta. After hitting an iceberg they've been stranded beside their vessel in the middle of the Ross Sea. It's not a great situation in anyone's book and I sincerely hope their boat is repaired and they are returned safely to their families. Rescue Mission Coordinator Neville Blakemore said the crew was continuing to pump water from the ship using the on-board pumping equipment and one that was delivered yesterday by the NZ Airforce. “They are keeping ahead of the water ingress using two pumps,” Mr Blakemore said. “But they are having difficulty in trying to fix a patch to the damaged part of the hull because they need to stop one of the pumps to do this, and then the water level creeps up again.” Mr Blakemore said Sparta’s stability was currently the number one priority for the rescue operation. Check out TVNZ’s story here. This is by no means the first time that a vessel in the Ross Sea Toothfish fishery has got into difficulty and brings home how dangerous it is. An Olympic style fishery (a race until the quota is caught) is highly competitive, boats want to catch as much as they can, as quickly as they can and the highly competitive nature of fishing undoubtedly pushes crews and their vessels into marginal areas. I have seen these boats departing for the Ross Sea from New Zealand and they do not fill you with confidence. 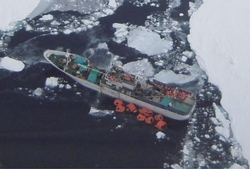 While the stranding of these vessel brings this fishery in the Ross Sea to media attention and raises questions about the potential for an environmental disaster, what is often overlooked is the simple question – why are these boats here in the first place? The answer will reveal another impending disaster – more insidious and far reaching, it’s the destruction of the world’s most intact marine ecosystem. All the very best to those involved in the repair work and rescue, it’s in all out interests that we get this ship repaired and back home as soon as possible – hopefully to never return. Commission for the Conservation of Antarctic Marine Living (CCAMLR) is the annual meeting where the 25 member nations gather to make the decisions on matters regarding the waters around Antarctica - including the Ross Sea. This is the last meeting before the commission intends to decide on the level of marine protection in the Ross Sea at their meeting in Nov 2012. This year NZ & the US, both tabled proposals for a Ross Sea Marine Protected Area and while their representatives deserve huge credit for doing this and for getting the MPA ball rolling within their respective countries, neither proposal in its current form is bold enough to deliver what the Ross Sea really deserves - full protection, in order to preserve the integrity of the Ross Sea ecosystem - the most intact marine ecosystem on earth. We have one year to raise awareness of the Ross Sea and what the world has to loose if this fishery continues. It's a huge challenge but we are taking it on. A brief background. In 1996 CCAMLR comprised of 12 nations. NZ sent one fishing vessel to the Ross Sea to explore potential fishing grounds for toothfish - they found plenty. The floodgates opened and now there are up to 20 boats from 12 different nations fishing in the most untouched and intact marine ecosystem on Earth. It’s no surprise that CCAMLR’s membership has risen markedly and with fishing nations like Korea, China and Russia joining the fold putting CCAMLR's consensus decision-making system to the test. In the past couple of months, Last Ocean has been making headway in the media both nationally and internationally. Local journalist Michael Field wrote a well-researched article outlining New Zealand’s stand on fishing in the Ross Sea and more recently the controversial stranding of the Russian fishing vessel Sparta. John Weller, Cassandra Brooks and David Ainley also had features in several magazines in America. Click here for more articles. The Last Ocean edit finally begins. I’ve just had four weeks in Wellington where I’ve been working with old friend and excellent editor Jonno Woodford-Robinson who as most people know is as famous for his tea-making as he is his cutting. Jonno and I went to broadcasting school together decades ago and worked on a few projects together then. Last year he heard my interview with Kim Hill on Radio New Zealand and got in touch saying, ‘I’ve got to help you make that film’. We’ve spent the past four weeks going through hours of interviews laying down the foundation for our story. It is compelling and powerful and we haven’t even put the pretty pictures to it yet. I’ve been involved with this project since 2005 but it has always fitted around my paid work. It’s the first time I’ve really had the chance to sit down and focus on it. I bring my own stated bias to the film in that I want to see the Ross Sea protected and although fishing is the main threat to the ecosystem this is not an anti-fishing film. It will paint a realistic picture of what’s going on in the Ross Sea, why hundreds of the world’s leading Antarctic scientists want to protect it and the political ground that needs to be covered in order to do so. A huge thanks to Erich Hoyt from Whale and Dolphin Conservation Society who has organized a donation to kick start the editing process. Thanks also to the friendly folk at Park Road Post for having me there. The added bonus in all this was spending time in fully functioning city. With my house in Christchurch currently being repaired from earthquake damage I owe a huge thanks to my partner Tracy who encouraged me to go to Wellington so I could escape the chaos and focus on the project. I’m still trying to work out if it was just that she wanted a clear run at the colour scheme! We announced the winners for the short film competition at an awards ceremony that was held on 15th of September at Heritage Expeditions in Christchurch. It was a great night and it was inspiring to see the local support we had for the competition and the Last Ocean cause. Congratulations to the Open category winner Bill Morris who won a trip to the sub Antarctic islands. A list of all our winners can be viewed on our website. I first became aware of the Last Ocean project when Peter Young gave a presentation in Dunedin earlier this year. 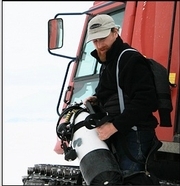 As a writer and filmmaker I was already somewhat aware of the unique beauty and incredible rarity of the Ross Sea, however Peter’s presentation really woke me up to the risks posed to it by commercial long-lining. When the film competition was announced I didn’t hesitate to begin planning a film – one look at the top prize of a trip to the sub-Antarctic islands was all I needed to spur me into action. I live in Port Chalmers, the main harbour town of Dunedin. From here, many expeditions have departed for the Antarctic region. Above the town stands a stone monolith commemorating the doomed expedition of Robert Falcon Scott and his crew on the Terra Nova in 1910. I decided to use this very real link to Antarctica and the Ross Sea as a hook for my film. New Zealand stands at the gateway to Antarctica – and in my mind that position carries a responsibility to care for it and take an active role as stewards of the last great wilderness of Earth. I will use the trip south to further my research and gather photographs for a book I am writing about whaling in New Zealand. I would like to thank Peter and the Last Ocean Charitable Trust for opening our eyes to this incredible corner of the world and the urgent need to protect it for the future. 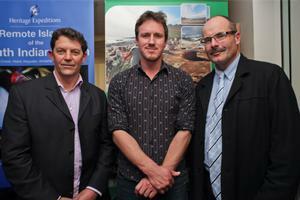 Competition winner Bill Morris with Fisheye Film's Peter Young (left) and Antarctica New Zealand CEO Lou Sanson (right). Last Ocean supporter Brandon Stone has been putting in the hard yards for the Ross Sea. Brandon runs an adventure tour business On the Wildside . Starting 21 February next year he’s doing a sponsored walk through New Zealand’s best National parks, trekking 11 trails, over 750km in 32 days non-stop. The purpose of Brandon’s walk is to promote the conservation of our oceans and its inhabitants and his focus on this trip is the Ross Sea. As he says on his website "The amazing Humpback Whales that we swim with every year in Vavau, Tonga have migrated directly from these rich feeding grounds in the Ross Sea (and neighbouring Southern Oceans below New Zealand) to Tonga to breed. We want to support the protection of this habitat and protect Humpback Whales migration from the Ross Sea to Tonga." Brandon is seeking sponsorship and donations for his walk and giving them to the Last Ocean Charitable Trust. If you feel inclined (please do) - you can read about the walk and make a donation here. Happy travels Brandon and a huge thanks from us! John B. Weller is a nature photographer and writer based in Boulder, Colorado. He was trained in economics and philosophy at Stanford University and has been photographing professionally since 1999. His work has been shown in prestigious museums and galleries and is part of private and corporate collections across the world. He has had more than 20 one-man photography shows since 1999, and his work has been published in magazines including Outdoor Photographer, American Photo, Rangefinder Magazine, and National Geographic. Weller started The Last Ocean with David Ainley in 2004. Since then he has worked full time on the project, wearing many different hats – strategist, grant writer, fundraiser, organizer, graphic designer, and finally, photographer. Weller was recently awarded a 2009 Pew Fellowship in Marine Conservation, which will support further development of the project. Last year Weller's Last Ocean short film was a finalist at the Blue Ocean Film Festival. His current Last Ocean exhibit at the US National Museum of Wildlife Art has already gained wide praise. 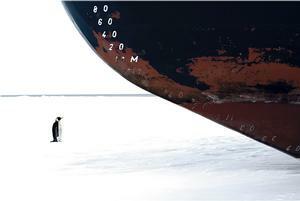 Weller is also currently working on a Ross Sea Last Ocean book of photography and essays, which should be out in 2012. Take a look at some of John’s work here. Our online petition continues to grow. It will eventually be presented to the NZ Government and if we get enough people signing will be an important tool in our campaign. It asks the New Zealand Government to phase out fishing in the Ross Sea and promote the establishment of a comprehensive no-take marine reserve for the entire Ross Sea continental shelf and slope. It only takes a minute to sign and you do NOT receive further correspondence from Change.org. who we run the petition through. Yes we are still blogging slowly but surely - and it's a great way to keep in touch with us between newsletters. Recent blogs are from Peter Young and U.S Last Ocean co-ordinator Cassandra Brooks. We also enjoyed this short video of an unusual underwater ice formation that was filmed by the BBC for their Frozen Planet Series. The first time anything like this has been caught on film. It's great to see our Facebook community continuing to grow. We now have 700 plus fans – it’s a wonderful way to keep up with the latest news and developments around Last Ocean campaign. Thanks to all who have joined and please spread the word. Until next time...have a wonderful Christmas and will be in touch in the new year.